I have been trusting eCryptfs with my entire home directory since December, and things have been working well. Add "user-setup/encrypt-home=true" just before the "--". In either case, however, you will not be able to hibernate your system (but suspend will continue to work just fine). 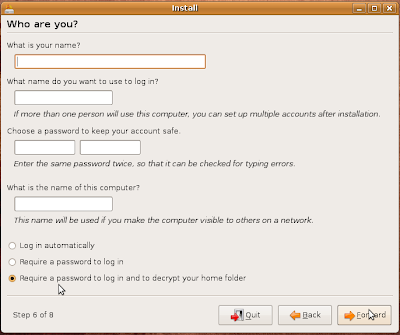 It is for this reason that the option is hidden in the default installation. We're trying to fix the swap issues for Karmic. We won't be able to provide an automated mechanism for live migration of data into your encrypted home directory in time for Jaunty. (Sorry, more pressing Ubuntu Server work took precedence...) I will provide some step-by-step instructions (and maybe a script?) here in my blog--stay tuned! Won't fully encrypted home directories also disable sshing into a system with public key authentication? Is this in the installer as of alpha 5? I just booted into alpha 5 in my VM, making sure to tack on that book parameter, and did not see the encrypted home option in the installer. Might I have been doing something wrong? 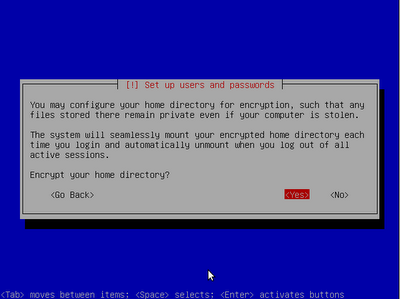 Update: I downloaded a daily build and successfully installed that in my VM with encrypted home directory. So ether the newer build fixed the problem, or more likely PEBKAC. Dustin I think in Alpha 5 the encrypted home was removed from the live cd. You might want to check it out. What impact on performance does this have? I'm especially interested in knowing how having an encrypted home directory would affect a netbook such as say the Asus EEE PC 1000h or the HP 2133. I'm looking at buying something like one of those in the coming week and will put Ubuntu on it. But since these machines are low-end already... any ideas? Very cool. So does this mean there's now a separation of a user's password from the user's decryption password? This was an issue brought up in your previous post--oftentimes we want our encrypted data passphrase to be significantly longer than our user passphrase. If you're already logged into the system elsewhere (on the desktop, another ssh session, etc), public key will work. However, you're correct. If you trying to start a brand new session, your ~/.ssh/authorized_keys file will not be available. There is a performance impact. In some cases, it's negligible, but in others, it's not. It really depends on what you're doing. On my dual-core/4GB Thinkpad, the performance hit is absolutely unnoticeable. On single Atom or Celeron processor, though, it might be a bit more trying. I'm now installing alpha 6 with encrypted home. Nice work Dustin, Thank you so much! Hi Dustin, any news about this? Any updates on moving an existing users home directory to an encrypted one ? Any instructions to convert existing unencrypted home to encrypted one ? Ok, I have a HUGE problem right now. I just had to reinstall Jaunty (due to driver issues) and now I can't access my files. I have my /home folder on a separate partition, so I didn't even think twice about reinstalling my OS. Now it seems that the encryption key (encrypted by my login password) is actually stored in /var/lib/ecryptfs/user?!? Is there ANY way to recover my encryption key? All my files are still there, I just can't open any of them and very few actually got backed up. If someone can even give me a command to grep my hard drive for a pattern that matches something that would be in the cypher file, it would be greatly appreciated since there is a *slim* chance it may still be there. If I am correct about they way the key is stored, please consider my case when revising your system and put the keys in the "/home" folder! Home directory encryption seems to be linked to a user's password in a non-functional way. I created a user with an encrypted home directory and then later changed that user's password. When I logged out and back in, I no longer saw any of my previous home directory files (I had a functional but default home directory). Changing the password back to what it was when I set up the encrypted home directory restored all of my files and settings, but it should be possible to change your password when using this feature. This glitch made me think that it might actually be trivial to add a "panic" password (which would open to a default home directory) to this system as well as the regular one (which would open the encrypted home directory files). I chose "encrypt home directory" during Jaunty installation, and I have two questions regarding encryption. I can see printable text in that partition. So, I thought the contents of files are encrypted not only their headers. So, aren't the contents of files encrypted? Are these normal messages, or smt wrong in my setup? By the way, I don't have the file you mention in your blog, ~/.wrapped-passphrase, instead I have ~/.ecryptfs/wrapped-passphrase. Is this normal? I'm trying to create a new user with encrypted home dir using 9.04 live on some usb pen drive with persistence. Using "sudo adduser --encrypt-home foo_user" the account is created just fine, but I cannot graphically login because gdm doesn't start. I can only login using the console. mount | grep "$HOME type ecryptfs"
# equals whatever shell you use! If you use keychain (SSH passphrase caching app using ssh-agent) and add it to your .bashrc so it starts on login, it will remain resident and you will not be prompted for your password until next reboot. This means your home directory is unencrypted even though you're not logged in though, so beware! Every six months, I am tempted to try out an encrypted Home directory from a clean Ubuntu installation (rather than symlinking to a Private mount point), but I simply don't trust it. I can't sleep at night unless I have recovered from simulated failure several times. Given the nature of encrypted data, I can't be the only paranoid user. Perhaps an advanced tab would be helpful which included, among other things, the ability to choose our own mount passphrase. I think the two big announcements on encryption home directory & file names are really awesome. An encryption is a set like having a virus scanner running in the background on Windows all the time. With this new version now we can also encrypt other sensitive data. It is much easier to install and the important Caveats helps me a lot to make my task easy. I think security and usefulness of Ubuntu system depends upon a good deal on what we do to enable users and their privileges. 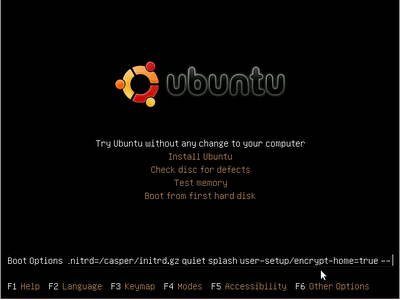 Without falling into the minutia and the mundane, it is most important to at least understand how users are handled in the Ubuntu GNU/Linux environment. The points describes in the post are very helpful, thanks Dustin for the huge info.